Upcoming mixed-use development located steps from Kendall Square that will transform the existing 22-story Sullivan Courthouse and Middlesex Jail tower in East Cambridge into a 20-story mixed-use tower. The new 40 Thorndike Street will feature approximately 430,000 square feet of office, research & development space and 15,000 square feet of ground-floor retail, along with 24 apartment residences on lower floors. Lower office floors will be marketed to startup companies as innovation space. Retail will include a grocery store and a health club; a daycare could be included as well. The transformation of the vacant Sullivan Courthouse and Middlesex Jail tower in East Cambridge has moved forward with the Massachusetts Appeals Court's upholding of the project's approval, ending a lengthy court battle and allowing developer Leggat McCall to proceed with construction. 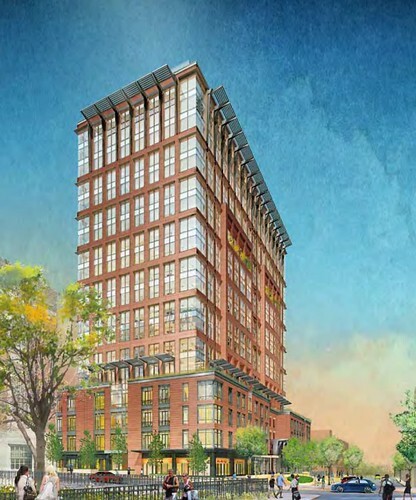 A group of East Cambridge residents had sued to block the project, citing concerns with the tower's density and height. Construction will now begin imminently on a gut rehabilitation of the tower, located at 40 Thorndike Street in East Cambridge. The tower will be converted into approximately 430,000 square feet of office, research & development space, 15,000 square feet of ground-floor retail and 24 apartment residences, all within the existing structure. Two floors will be removed from the existing 22-story, 282-foot-tall tower, resulting in a 20-story structure that is 24 feet shorter.